Given “young, hungry males” are still a dependable demographic for the fast food industry, Sonic will now dangle Red Bull in front of their eyes like a hypnotist’s watch: You are getting veeeeery hungry and probably low on caffeine. The Bloomberg piece notes that Sonic has mostly avoided adding healthier items to its menu, even as other fast-food chains add healthier choices to kids’ meals and roll out vegetarian menus. 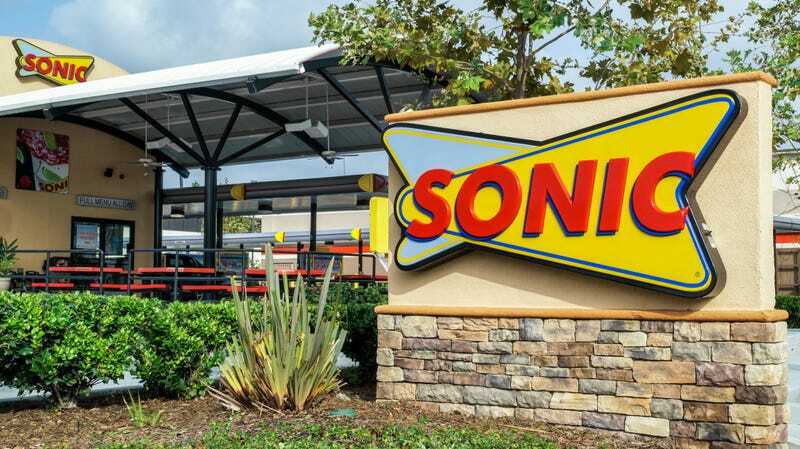 Sonic’s new menu items include an all-day bacon- and fried-egg-topped Brunch Burger and a Double Stuf Oreo Waffle Cone, and the chain is reportedly working on Broccoli Cheese Tots, which potentially pass for a healthy option these days. We can perhaps look at this as a microcosm of fast-food in general: By innovating to reach more health-conscious consumers, do chains risk alienating their base, their core customers who like triple beef patties and soft-serve ice cream and bacon fries? Or can fast-food restaurants straddle that line, offering something for everyone? An analysis of fast food meals over the past 30 years recently found the drive-thru board is less healthy than ever, packing more sodium and calories per year than in the past. And now, more caffeine, too.